Paragliders float to Earth in July 2018. Westley Portwood died from injuries he suffered in a paragliding crash in Lemhi County. 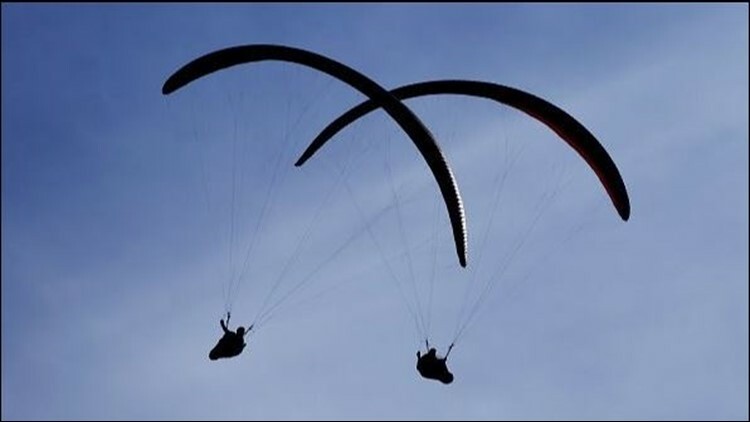 GILMORE, Idaho — Authorities say an Idaho man died after succumbing to injuries suffered in a paragliding crash in Lemhi County. The Idaho State Journal reports the Lemhi County Sheriff's Office says 40-year-old Westley Portwood, of Pocatello, was operating a motorized paraglider on Tuesday east of Gilmore at the time of the crash. Life-saving measures were unsuccessful and Portwood was pronounced dead. The cause of the crash has not yet been released. In addition to Lemhi deputies, Leadore emergency medical personnel and Salmon Search and Rescue crews responded around 3:50 p.m.
Gilmore is about 150 miles north of Pocatello.